I really love to snack. I know it’s not what we’re supposed to do to maintain (or lose) weight, but I find myself wandering around the house when I’m bored, looking for something that might be delicious. This recipe has saved me multiple times by being easy to make, yet satisfyingly delicious while still being fairly healthy. Since I love to incorporate wine into anything I make or bake, this recipe has become one of my own after starting as one from a published cookbook (Simply Delicious). Start by preheating the oven to 350 degrees and spray a baking sheet with cooking spray. Mix your dry ingredients together: 1 1/8 cup flour, 1T ground espresso coffee, 1 t baking powder, 1/4 t cinnamon, and 1/8 t salt. Whisk your wet ingredients until frothy: 1/2 cup sugar, 1 egg, 1 1/2 T brewed espresso, 1/2 t vanilla, and 1 T red wine (I used a Merlot in this recipe, but use whatever red wine you like). Combine your dry ingredients into the wet, until they just come together. Roll the dough gently, on a floured board with floured hands, to form a log. Carefully transfer the log onto the baking sheet and pat it into a form about 3/4 inch high and 2 inches wide. Bake the log until it’s firm to touch, about 20 minutes, then transfer to a cutting board and allow to cool for 5 minutes or so. Reduce heat in oven to 300 degrees. While log is still warm, cut into 1/4 inch slices, using a serrated knife, and lay the slices back on the baking sheet in a single file. Bake biscotti for 10 minutes, flip, and bake for another 10 minutes, or until dry. Remove to a wire cooling rack and cool completely. The biscotti will become more crisp as they cool. If you want to add an extra touch, warm chocolate chips and drizzle over an end of the biscotti. This is not necessary but is a delicious addition if you’re not planning to use these for dunking in coffee or hot cocoa. I really liked the addition of the red wine to this recipe. The flavor was just a touch deeper and it didn’t alter the consistency of the biscotti in any discernible way. I like keeping these on hand for when someone stops by to visit… it’s always nice to seem prepared for company with such an elegant thing to add to a shared cup of coffee. Hope you find them as tasty as I do… I love these! 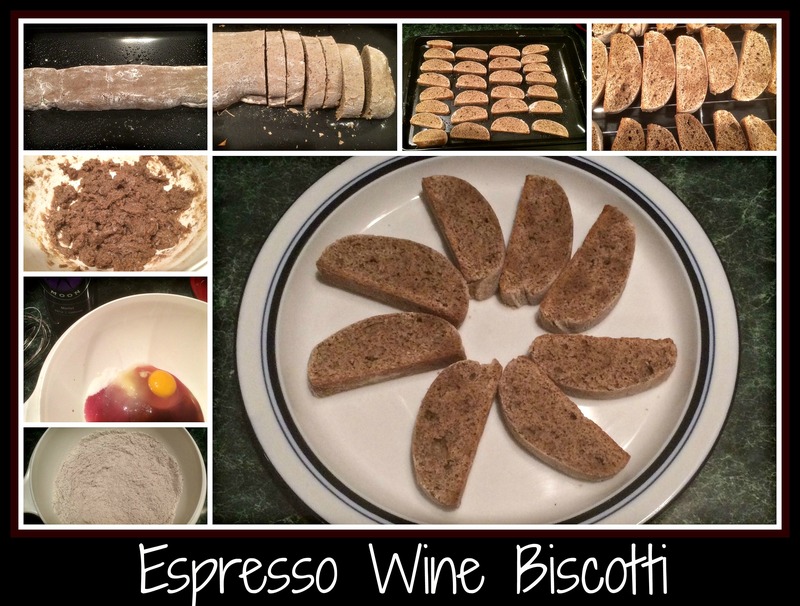 This entry was posted in Cooking, Recipe, red wine, Wine and tagged biscotti, coffee, easy recipe, espresso, red wine. It was really wonderful to meet you in Hilton Head – hope to keep in touch and see you again next year!